Daedra are creatures from the planes of Oblivion. A separate article describes Dremora, who are treated as NPCs instead of Creatures. The Daedra on this page are also all listed in the Oblivion-Creatures-Daedra category. Strictly, Daedroth (plural: Daedra) is a general term for any divine creature that comes from planes of Oblivion. By this definition, all Daedric Princes and Dremora are also Daedra. 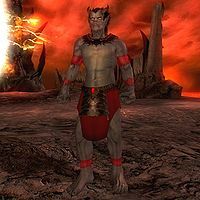 However, in common usage the term Daedra is used to refer to all of the lesser beings from Oblivion; in this context Daedra is used as both a singular and plural noun. Daedroth (plural: Daedroths) is then used to describe just one particular variety of Daedra. Most Daedra (but not all) are resistant to fire and weak to shock. Most Daedra can be summoned; a complete list of summonable Daedra is provided under Summons. Conjurers are very likely to summon Daedra, and conjurer dungeons frequently contain Daedra; conjurers will not attack these Daedra, because they both belong to the Conjurer faction. Daedra: A general overview of Daedra as encountered in all the TES games. The following table lists only standard Daedra, i.e., those that are generated from standard Leveled Lists. This includes the vast majority of the Daedra encountered during the game. Some creatures' health varies depending upon the player level, indicated by an equation in the Health column. The lvl used in the equation is the player's level. The soul for these creatures is usually variable; the souls column indicates the range of soul strengths that are possible. The following two tables summarize the vast majority of the leveled lists that are used to generate Daedra. The first table provides the lists used to spawn Daedra only. The second table provides several lists that are used to spawn either a Daedra or a Dremora. There are a few minor variations, which are noted below each table. Frost Atronachs are left out of several lists. Therefore, Frost Atronachs are only rarely encountered in planes of Oblivion; they are usually only encountered in conjurer lairs and a few other places such as Mankar Camoran's Paradise. Xivilai come in both armed and unarmed varieties. Which type appears is always randomly determined (with a three in four chance that the Xivilai is armed). There are some quest-specific Daedra leveled lists that are not covered by this table. These quest-specific cases generally are just offset downwards from the standard leveled lists by 1 to 5 levels. Summoned versions of creatures do not drop any ingredients. 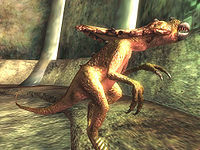 Clannfears are dinosaur-like Daedra that resemble a lizard with a large, bony crest on their head and a sharp beak and talons. They may represent common, wild animals in Oblivion. 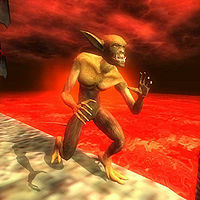 The Clannfear Runt is a weaker version of the Clannfear that is encountered at lower levels. Due to their great speed and considerable strength, they are fearsome opponents, especially at lower levels. See Clannfears for general information. 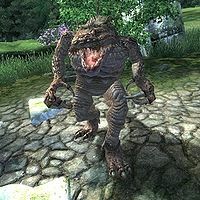 Daedroths are another type of beast-like Daedra believed to be common as wild animals in Oblivion. (When talking of this specific creature, Daedroths is an acceptable plural form of Daedroth). They resemble large crocodiles who walk upright. In addition, they will always cast their Daedroth Shield spell before entering combat. 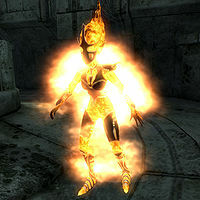 Flame Atronachs are the weakest of the three elemental atronachs that are encountered in Oblivion. They appear as a semi-humanoid, female form with blackened armor (that cannot be looted) and are surrounded by a veil of flames. Their primary attack is using Fire Damage spells. This atronach has one major weakness that you can turn to your advantage: the attack pattern is painfully obvious at distanced range. They prefer to stay at a distance, in fact, so you should have no trouble dealing with them. Grab a bow or a destruction spell based on damaging health (other than anything related to fire of course) for example: Snowball. Then watch them closely. Right after it casts a fireball at you, dodge it by moving to either the left or right. Do not move AS the fireball is shot at you as you will get hit. Then shoot at them with your bow or spell. Repeat this process until the atronach is dead. If at close quarters, they will flail around wildly, hitting you with whatever they possibly can. Block the attacks any way you can and try as hard as you can to replenish your health when possible. Though their bodies are encased in flames, standing in water doesn't seem to damage or affect Flame Atronachs in any way (like all atronachs, they are unable to swim). 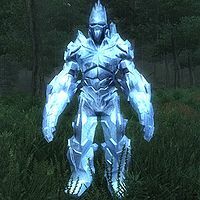 Frost Atronachs are the intermediate-difficulty elemental atronachs that are encountered during the game. They appear as a humanoid figure composed entirely of ice. Frost Atronachs are not spawned by the standard Daedra leveled lists that are generally used in planes of Oblivion. Therefore they are the least common type of Daedra. The only leveled lists that will spawn Frost Atronachs in planes of Oblivion are those that generate boss-level or high-level Daedra, and even then only at level 13 or level 15, respectively. 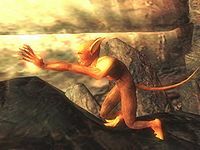 Scamps are the weakest Daedra encountered in Oblivion (especially the smaller, weaker version, Stunted Scamps). Stunted Scamps are encountered starting at level 1; regular Scamps are encountered starting at level 7. However, some quests involve regular scamps even if you undertake them before level 7; see Scamp Skin for more detailed information. See Scamps for general information. 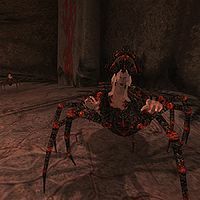 Spider Daedra are relatively powerful Daedra, encountered starting at level 18. They look like giant spiders with human female torsos. Spider Daedra will always summon Spiderlings, which are identical in appearance to Spider Daedra except smaller. Same spells as standard Spider Daedra, except no Summon spell. 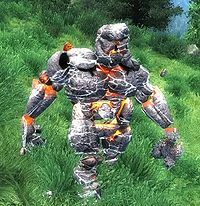 Storm Atronachs are Daedra of elemental shock, and are the strongest elemental atronachs that are encountered in Oblivion. They appear as a cluster of rocks quickly revolving around an unseen center of mass. With their large health and lack of weaknesses, Storm Atronachs can be very challenging enemies. *For some reason several of The Sunken One's spells are labeled as though they were frost damage spells, even though they're actually shock damage. You'll probably never see this, however, unless you open your stat window immediately when being hit with one. Xivilai are highly intelligent Daedra that are only encountered at high levels. (Xivilai is both the singular and plural form of this word). Although similar to Dremora, in that they are both humanoid Daedra, Xivilai have no caste system and therefore do not have any ranks. Also, Dremora are considered to be NPCs, whereas Xivilai are creatures. 33-50% Spell Absorption: armed Xivilai all have 33%, and unarmed have 50%. Stunted Magicka: they rely upon spell absorption to regenerate magicka, so be cautious about casting spells at them. Lair of Anaxes during the quest Paradise. Helping him allows you to have Kathutet help you instead of having to fight him. †Unlike regular Xivilai, the summoned version has 0 fatigue. This means that if the Xivilai is hit by anyone using Hand to Hand combat, he will fall down. *Although summoned Xivilai have the "Heat Blast" spell in their inventory, they do not have enough magicka to cast the spell unless you cast a custom Fortify Magicka spell on them. Template for creatures in Mankar Camoran's Paradise; provides default behavior for leveled list creatures. Template for creatures at Fort Sutch during the quest Attack on Fort Sutch; provides default behavior for leveled list creatures. Template for creatures that attack from the first gate that opens during the Defense of Bruma quest; provides default behavior for leveled list creatures. Template for creatures that attack from the second gate that opens during the Defense of Bruma quest; provides default behavior for leveled list creatures. Template for creatures that attack from the third gate that opens during the Defense of Bruma quest; provides default behavior for leveled list creatures. Template for creatures inside the Imperial Palace during the final battle in Light the Dragonfires; provides default behavior for leveled list creatures. 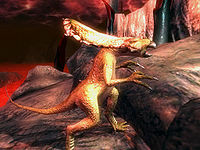 Template for creatures outside the Imperial Palace during the final battle in Light the Dragonfires; provides default behavior for leveled list creatures. Template for creatures found in Kvatch Castle Courtyard; provides default behavior for leveled list creatures. Template for creatures found in and around Kvatch; provides default behavior for leveled list creatures. Template for creatures found during the Breaking the Siege of Kvatch quest; provides default behavior for leveled list creatures. Template for respawning creatures found during the Breaking the Siege of Kvatch; provides default behavior for leveled list creatures. This page was last modified on 22 April 2018, at 07:01.